Beautiful month with pretty memories and you look so dashing in the modelling picture with sweet Simone Belli. Hi Lilli! Flowers, colors, nature and looks sounds like the perfect July! The place you live in must be lovely now, with those fine beaches and nice nature around. I love the photo of you lying on the beach with the big hat - it's like straight out of a magazine! From the looks of your July photos, you are definitely enjoying all the pleasures of summer Lilli! I haven't gotten to the beach at all so I'm happy to just live vicariously through you! Happy weekend sweets! Splendide queste foto Lilli... tutte!!!! 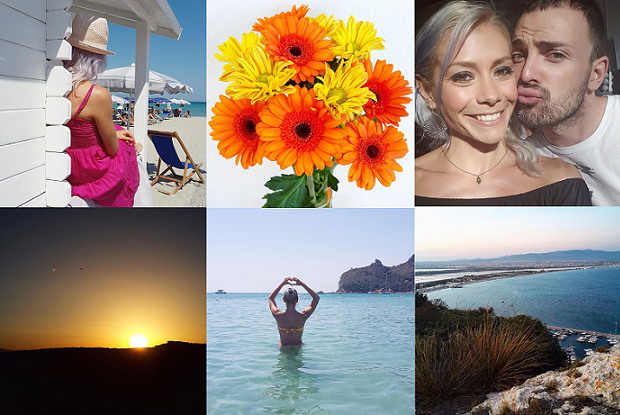 What a gorgeous recap, Lilli and looks like you had a brilliant July! Hope you have an equally if not more better August! Unbelievable, again is a month over. The time ist running. Dear Lilli, you delight us every day with so many nic pictures at Instgram. It´s a pleasure to follow you. SO many great fotos. i love the golden hour picture so much. HI Lilli, you must truly love and enjoy summer. Ypur photos here show it. Nice recap Lilli, I hope August be a nice month for you! Kisses. So nice to see the beach and sea photos. I can't believe that I haven't had a real holiday for more than two months! My fave pic is the one of you and Simone; great shot!